Kathmandu ranks fifth in the 2017 Pollution Index report published by Numbeo.com, which tracks pollution level of cities across the globe. Ghana’s capital city Accra tops the list whereas New Zealand’s Wellington is the least polluted city among 269 cities surveyed. Our pollution level is five times the World Health Organization (WHO) prescribed level. The dire effects of this are there for us all to see. Incidents of respiratory dysfunction, kidney failure, bronchitis, eye irritation, allergies, stroke and asthma have rapidly increased in Nepal in recent times. Environmental pollution is now among top global killers, responsible for one in six deaths worldwide. Nine million people died prematurely from pollution related diseases in 2015, accounting for 16 percent of all deaths worldwide. Almost all of the pollution related deaths are happening in poor and developing countries like Nepal. This has cost the world an estimated $4.6 trillion a year. The Indian Medical Association declared public health emergency in New Delhi in November this year because of high level of air pollution. Air pollution there is nearly 30 times the level considered safe by the WHO. Delhi’s polluted air causes more damage to the lungs than smoking two packs of cigarettes a day. In fact 98 percent of cities with more than 100,000 residents in low and middle income countries fail to meet the WHO’s air quality guidelines. According to a Lancet Commission report on pollution and health, pollution is more deadly than smoking. It kills nearly 15 times more people than all wars and violence combined, and is three times as deadly as AIDS, malaria and tuberculosis. Pollution control must be the top priority of any government in Nepal. In Kathmandu and other cities in the country, pollution has resulted mostly from fossil fuel combustion. Globally fuel combustion accounts for 85 percent of air borne particulate pollution. Most of the pollution in Katmandu is locally generated. Thus the government can control it if it gets more proactive. 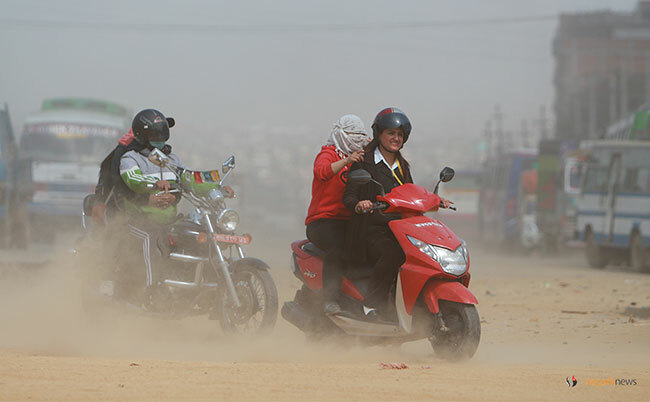 Suspended particles like dust and exhaust from vehicles and diesel generators are main source of air pollution in Nepal. Most studies have shown that vehicular emission is the main contributing factor to air pollution. Vehicle congestion and unregulated brick industries have made the situation worse. The Department of Transport Management (DoTM) has plans to enforce vehicle emissions standard throughout the country and has decided to buy 40 sets of emission test devices to enforce this regulation. Once the test devices are bought, as the plan goes, the DoTM will conduct emissions test of vehicles through all of its 19 offices across the country. DoTM will issue green stickers to those which pass emission test and they can travel right across the country. Old vehicles which fail the test will be prohibited. This is a welcome move. But we need to do more. So far 12 Air Quality Monitors (AQMs) have been installed in Kathmandu, Pokhara, Chitwan, Rupendhehi, Kavre and Lalitpur. We need to install such devices in many more cities. Information and data released by these centers should be widely disseminated. If we start using public transport, in place of driving our own cars, it will also help reduce emissions significantly. Instead of burning wood and other biomass fuels for cooking or heating we can switch to natural gas or liquefied petroleum gas. We can make our cities pedestrian and bicycle-friendly, like Denmark’s Copenhagen, by creating more footpaths and bicycle lanes. The government should create the right infrastructure for this. Cycling not only reduces emissions but also encourages physical activity. Inside Kathmandu, around 700 or so Safa tempos provide clean transport at reasonable price without any government subsidy. If the government helps with initial investment in clean tech the private sector will be encouraged to curb their own emissions. Air pollution is a major threat to public health. Now is the time to make policy changes and take strong measures to reduce emissions.